« I Have Zilch for Today! Whew! We finished the Blogging from A to Z Challenge yesterday. We had a few glitches, like when mom went out of town for a few days, but mostly, we did it! Will we do it again next year? I’m not sure. It was very tedious challenging writing six days a week (seven if we did Sunday Selfies with The Cat on My Head) and finding topics that applied to me. I guess that’s why it is called a challenge, but it may be too much for this cat and her old mom. Mom says maybe we need to learn to think outside the box more! I’m not sure why — all kitties know that the best place is INSIDE the box. Some days, we could make current events fit that day’s letter. Some days, we really had to reach to come up with something. 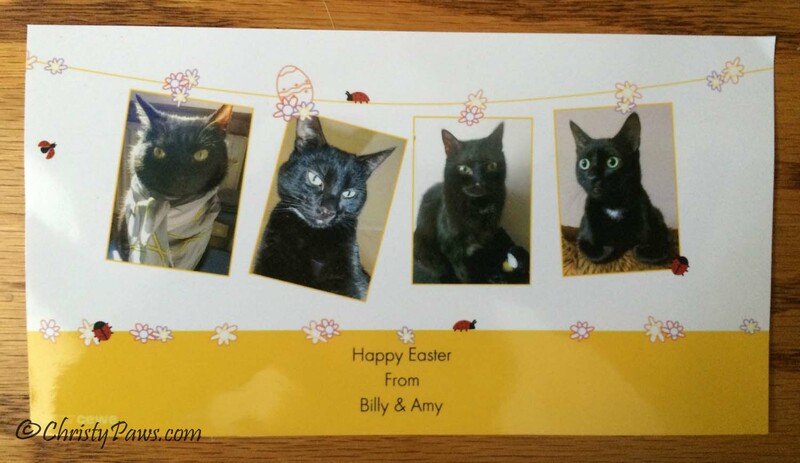 What I didn’t like is that it kept me from posting about some current events because we couldn’t figure out a way to make it apply, like the lovely Easter card I got from my friend Billy, the Time Travel Cat. There’s that box again! Our main reason for doing the challenge was just to see if we could do it, but another reason was to get new readers. I don’t think that happened. We had a couple of new visitors who commented but our readership did not go up noticeably. And I can’t blame anyone or anything for that. There were, in the end, 1516 participants, and we didn’t visit many of them either. Mom said something about not enough time. I think mom needs some time management courses. What’s that mom? You’ve been to many of them? So, what’s the deal then? There is something on this floor that smells so intriguing! 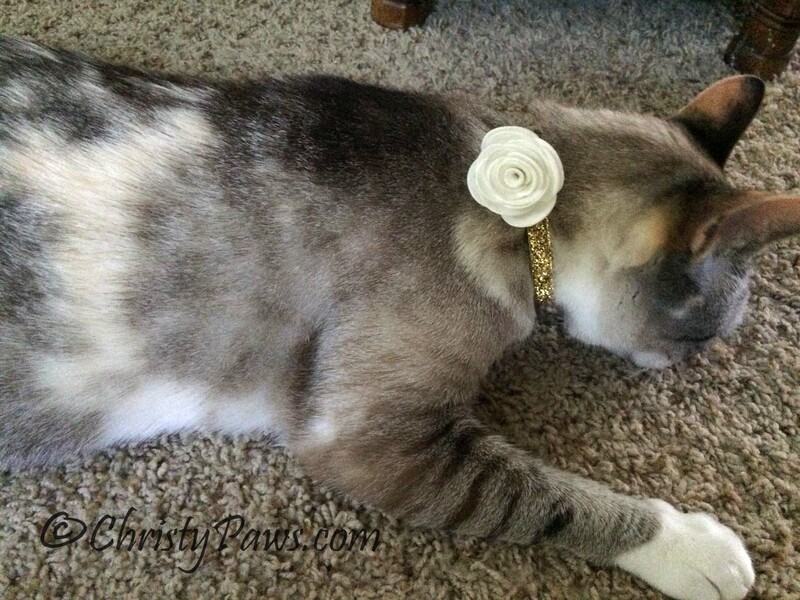 I got to tell you about the beautiful collar and corsage I won from Lola at Lola the Rescued Cat. We know all kitties have amazing eyes, but we think Echo’s are especially gorgeous. I posed the question, Is this the New Normal? I loved telling you Ocean’s Story. I told you how I helped mom with the foster kittens when she used to volunteer with a rescue. 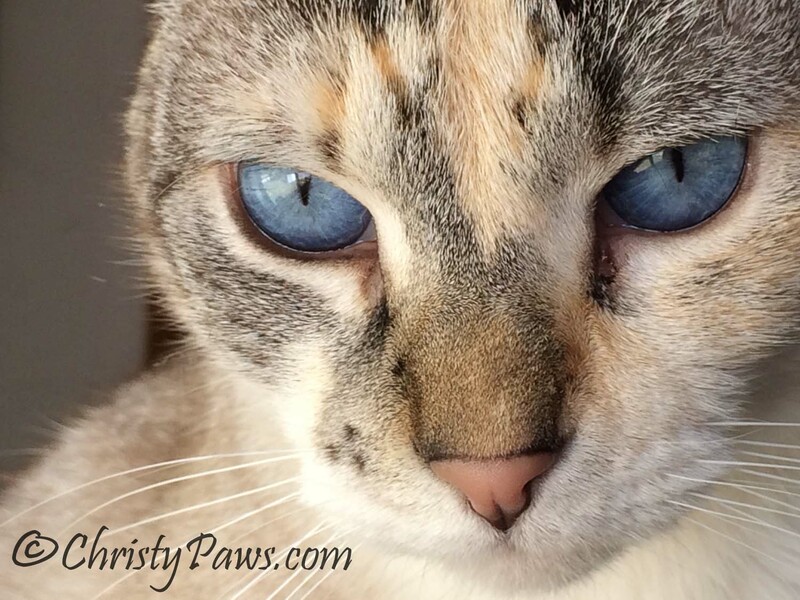 We posted mom’s pawsome instructions on how to make my raw food diet. I told you the story of my broken leg and tail and showed you the x-rays. We showed you some funny photos of all of us yawning. I hope you enjoyed some of these posts. We sure appreciate you taking the time to read them and comment. We will now be back to our regular routine, or so we hope. We usually post Friday through Monday and on Wednesday. Mom is going to try to get back to writing on her other blogs on Tuesday and Thursday. I’ll let you know if that happens! Have a great day filled with things from anipals to zoomies! Tagged blogging a-z, cat, cat eyes, cat photos, Christy, collar, foster, funny cat photos, raw food. Bookmark the permalink. 29 Responses to We Did It! ConCATs! we finished the A-Z Challenge too, and so understand your ‘challenging’ comment – maybe if I didn’t work full-time or have any other commitments. That is amazing work – congrats. It takes a lot of hard work to complete that challenge and you did it wonderfully. What’s really cool about it is seeing all the different sorts of posts that come out – sometimes having to narrow something down breeds some awesome creative ideas. Great job with the challenge! I would love it if you would link up to Happy Caturday at Sidewalk Shoes! We are behind with reading all of your post. I know what you mean! Keeping up with all our friends is not an easy task! We appreciated all of your posts but then again we normally do. A – Z would be quite the challenge and we must salute you as we didn’t attempt it. Congrats on finishing the a-z challenge! I know it is a lot of work. Yep! We do that every day. We try to add someone new every week or so. Well done! We read quite few and learned many new things about you. We enjoyed reading Ocean’s story. Such a cutie! Congrats! That was a challenging challenge and you did great! Yeah Christy, same here and we didn’t see much differences eevew. But it wuz fun fur a while. And we did enjoy weadin’ a lot of yous postys. But we always enjoy weadin’ ’bout ya’ and seein’ how y’all be duin’. YAY! Concatulations! and WHEWWWW! Our 2 faves were Ocean’s story and the raw diet! guys….we loved all de posts ewe did; sure we iz knot a loud ta play on line on de week oh endz, N we mite a mizzed a few…but ya did WAY better N uz….we prob ablee wooda getted ta C & said…two much Catnip……time for Zzzzzzz’z !! and missed everee thing in bee tween !!! Congratulations on completing that challenge! We learned a lot from you and admire your persistence! Oh, wow. Mom has read about that. That sounds really ambitious! Mes readed those posts and most excellent ob at completing the A-Z challenge! I think I saw every one of them and you did a pawesome job!!!! Admire your dedication! Thanks so much! I appreciate you reading them! Concatulations on the A to Z challenge completion Christy! Mom didn’t even start me on it because she knew she’d forget to do a letter somewhere along the way. YAY FOR YOU!!!!! !